We are asked to question the idea that an image presents an objective or timeless view of reality. Lewis dissects what a camera does to reality: “a camera to hold in your hand the image forming device/ aperture and effect focus on the range within which/ objects appear to be sharp for fractions of seconds…” and how that image is altered or even what happens when said images fade—in short, she forces us to look at our memories and identify the factors that contribute to haziness. The hypothesis posed in Camera Obscura is one that we’ve all pondered, albeit subconsciously on a regular basis. If we are constantly reinventing memories “for new ways of thinking about movement to lay in ability and reproduce reality” do we quickly forget that all of the images, visual, textual, sound-pictures are a blip on the screen we call life and each mini-reality is here and gone before we can blink? 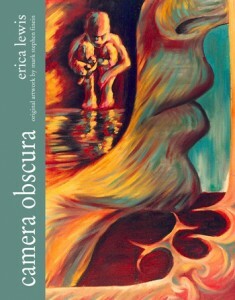 Camera Obscura invites us into the mystical world of the imagined and turns us inside out by exposing the reality of our pretend world.If we can look at the theories suggested in these pages with our eyes wide open, then perhaps only then we will be able to hold onto the images and people that exist only in our memories. Impermanence is something we all struggle with in life. How we choose to overcome the harsh realities in life really boils down to how we view our circumstances, what we chose to acknowledge as being malleable or damaged; Renee Norman carefully considers in these pages. The poems revolve around life and loss as seen through a mother’s point of view while incorporating issues of motherhood, parenting, love and the cultural traditions of Judaism.These varied pieces on mother-daughter relationships and the struggles that result as time ebbs and flows are only some of the themes discussed in Norman’s second collection. Aren’t you afraid to wear that? A grey-haired woman with a heavy Jewish accent points to my daughter’s magen david on a chain no, my daughter retorts with an attitude black lipstick wild hair trademark Adidas and some boy’s initials carved on her hand in colored felt. I wear a magen david, too point to mine around my neck it’s hidden, the old woman announces my star under the collar of my shirt it takes several generations to learn not to flinch. Kate Durbin’s Fragment’s found in a 1937 Aviator’s Boot (Dancing Girl Press) is an exploratory romp through various narratives which masquerade as a journal of the long lost Amelia Earhart. Durbin taps into the lines and phrases that connect foreign to the commonplace by giving us language to digest as fuel for our journey; a mapping out of uncharted terrain that Earhart once traversed. Durbin allows the text to be our guide in these short pages and we begin to ask ourselves, “did this fictionalized Amelia Earhart really exist?” Based on the elements in Earhart’s fictionalized space, we can only be haunted by an unknown back and forth between character and real-life humans, both of which seem urgent and relevant in these pages. 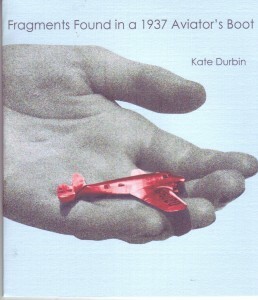 For years, readers, historians and the like have been fascinated with Earhart’s story and Durbin has placed her own poetic spin on what it means to possibly survive the horrors of isolation, if only for mere days on some rock of an island where life and hope is extinguished with a gasp for air.“I believe that little red plane was my awakening” is only a faint representation of the vast abyss that led to Earhart’s disappearance. The text here attempts to capture that, (as well as a plethora of additional emotions) in brief dialogue and conversation that quite possibly took place upon a plummeting plane. O Fallen Angel is an uncomfortable tribute to all the damaged girls, the toxic teenagers, college roommates and friends you’ve known that were all at once the best and worst versions of themselves. This work spews back at society the vile, misguided judgments we place upon one another with the style of a post-modern poet and the mind of modern day Woolf. The reality and banality of suburbia, its conventional ideals and preconceived notions regarding gender and voice are quickly demystified as Zambreno examines the root of our culture clashes. 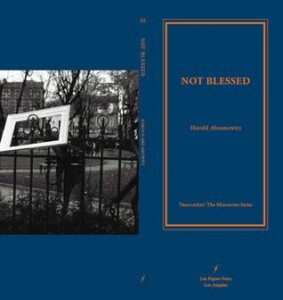 Here we are asked, what are accepted/dejected ideals on madness, cruelty and everyday life and the monotony that often exists in a middle-class landscape? I really enjoyed reading this. You’re so much smarter than me! I very much enjoyed your essay, particularly your thoughts on the Camera Obscura piece. I’ve given a good bit of thought to this business of how photography plays in our life, and in our memories in particular (my essay, for instance, To Transform Awareness, at Obscura Press). I will have to check this out. Thanks for bringing it to my attention–and thanks for the thought-filled piece.